Pumpthrough Optics – Key to DPSS Resonator EfficiencyREO Inc. The performance of dichroic pumpthrough mirrors (which typically transmit the pump light and reflect the laser fundamental), have a critical effect on the overall efficiency of DPSS laser resonators. One important step in achieving the desired loss performance in pumpthrough optics (as well as other resonator components) is the choice of thin film process technology used to produce the various mirror and antireflective coatings. A typical specification for a high performance pumpthrough mirror would be over 99% transmittance at the pump wavelength, and over 99.99% reflectance of the lasing fundamental. Multilayer thin film designs which achieve this target performance level are certainly possible; however, translating designs like this into actual components, especially on a volume production basis, can be a challenge. Many commercially available pumpthrough optics only provide >95% transmittance at the pump wavelength, and >99.5% reflectance of the fundamental. Similarly, rear reflectors should deliver over 99.9% reflectivity. At REO, we commonly achieve >99% transmittance of the pump, and >99.99% reflectance of the fundamental lasing wavelength in volume production, with very high unit to unit consistency, primarily by employing ion beam sputtering (IBS) technology. This deposition technology offers substantially higher precision than more widely employed evaporative coating methods, such as electron beam (e-beam) evaporation. Specifically, IBS enables better control of both the index of refraction and the exact thickness of deposited layers. The net result is the ability to more faithfully achieve the target design performance in the actual coating. This high precision, in turn, enables the routine production of more complex coatings with higher layer counts, thus allowing the realization of designs with inherently higher performance. 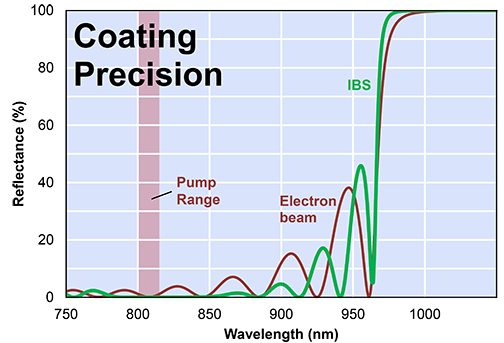 The impact of limited coating precision can be understood by examining the graph, which show the typical reflectance characteristics of a pump through optic produced with e-beam evaporation and IBS respectively. These coatings were nominally designed for maximum transmittance at 808 nm and maximum reflectance at 1064 nm. The most important feature to note in these graphs are the ripples in reflectance of the e-beam coating around 808 nm, which again, are caused by errors in the optical thickness of the deposited layers. In contrast, these fluctuations are absent in the IBS coating, which accurately reproduces the target design. These reflectance ripples in the e beam coating response primarily affect resonator efficiency in two ways. First, their exact amplitude and position can’t be controlled deterministically (because of the limited precision problem), so the exact reflectance of the optic at 808 nm varies from batch to batch. This is what limits the maximum transmission that the manufacturer can specify at 808 nm. For the laser builder, this variation makes it more difficult to build a consistent product and reduces design headroom. The second issue is that the exact wavelength of the pump diodes can vary over several nanometers from unit to unit. This translates into variations in total transmittance, depending upon exactly how the diode laser and pump through optic characteristics match up. Again, the result is inconsistent unit to unit performance in the final, assembled laser. The absence of these ripples in the short wavelength reflectance of components manufactured using IBS means that neither of these problems is present.